They’re raising some phenomenal kids, (all except Chelsea….who’ll have her first, a daughter, in January! *Can’t hardly wait!) handsome, pretty, smart….and teaching them all the right things as well as instilling in them, genuine character….something that you don’t find often in this day and time. I’d be fiercely protective of them if the need were to arise and I’d do for them anything that they’d ask of me. They’re, all three, amazing ‘gifts’ from the Lord to our family.…and I love them with an incredible, almost indescribable love. It’s a different kind of love. *Incidentally, Kelly….just two days ago (11/22/2015) had her third baby….our 8th Grandbaby!! A little boy, Knox River Taylor! Some of It’s ‘Taught’……But Most of It’s ‘Caught’! After observing for over half a century, and looking even closer the past 20 years or so it just seems to be a fact. We can spend a good deal of our time teaching or being taught…..and I’m definitely for that. I’ve committed myself to be a ‘learner’ up until my last day on the planet. And so far it seems to be working. It’s easy to be a learner if you want to be one. And, if you are really serious about being a learner it’s wise to understand that you can learn a little something from just about anyone. Learning comes in a lot of different packages. (Experience is a great teacher. I’ll write about that later.) Some of our learning came in the classroom. Especially, early on, we learned from teachers (or our parents) how to read, how to write and basic things like that. So, obviously, a lot of what we have learned in our lives has been taught. But as I look at myself and my life it’s clear that much, maybe even most, of what I know, and what I’m actually living out….I’ve ‘caught’ from others along the way. So, from here on out, I think we should commit ourselves to both….what we’re ‘taught’..….and what can be ‘caught’. As I write this I kinda wonder what people might say they ‘caught’ from me. I really hope some of it’s good. *Click on highlighted link to read. ‘Ol Mile Marker #62 – Well, That Sure Didn’t Take Long! When they were telling us all that stuff about how fast life goes by….I was listening. But I had no idea it would happen this fast! I didn’t think I was ever gonna turn 21….Now I can barely remember when I was. It is amazing, looking back, how fast the years do go zooming by. So, here I am clipping along at 62, ….with 70 in sight. And, as it appears….no slowing up! Then it’s the Big ‘6’ ‘0’!! Survived that one without much hoopla. And the 60 thing….it wasn’t painful at all. After all, 60’s the new 40, you know?! Well, that was two years ago. So here I am at the ‘ol #62 mile marker today and wondering how I got here so fast. I’m guessing 65 will arrive at my place in record time, and without much warning as well! If you’re a youngster reading this I’d encourage you to ‘get ahold’!! It’s all gonna happen pretty fast. The Bible even says, “Life is a vapor”. I can totally relate. So, what’s a feller to do?? Well, to each his own but for me….I’m gonna keep my body movin’, I’m gonna try to worry less and laugh more. I’m gonna love and enjoy my wife more than ever. I’m gonna keep on enjoyin’ watching my kids become great parents themselves. 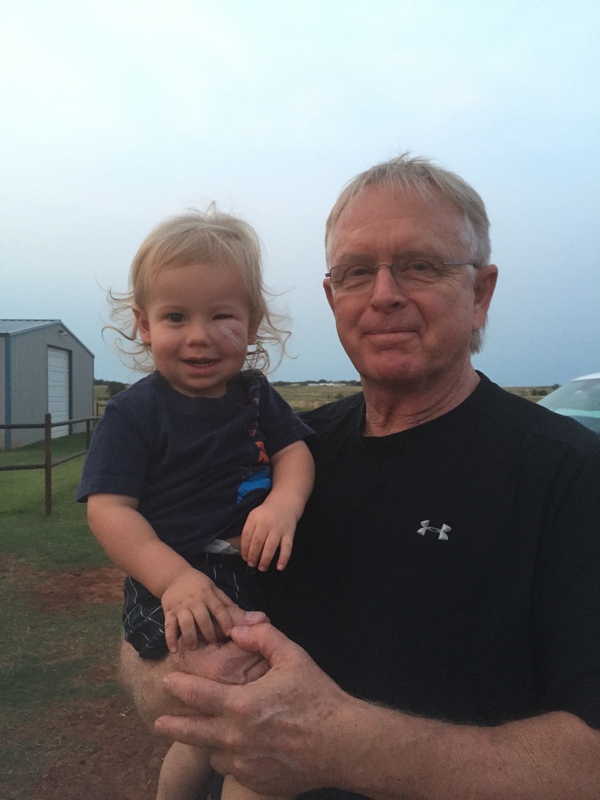 I’m gonna keep on doing the one thing I know I’m good at…..being a Grandpa! I’m gonna see my Mom & Dad as often as possible! I’m gonna keep on enjoyin’ my friends! I’m gonna keep on helpin’ anyone who cares, …..to know God as a Father. And, I’ve took a look out there; I can see out there a ways….65, 70, 80 ……….It all looks good from here!